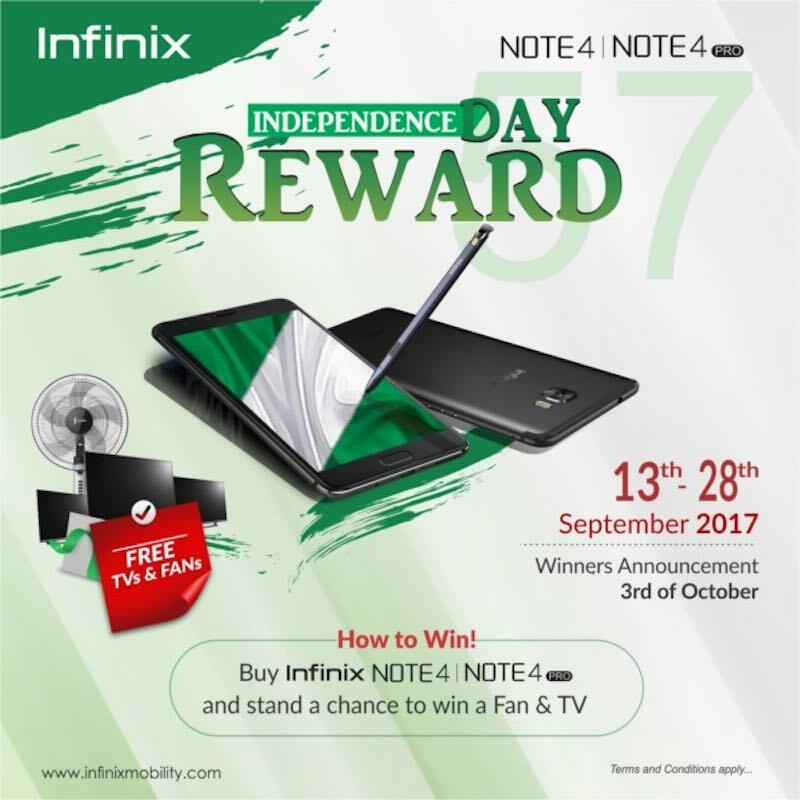 The brand introduced the Infinix independence reward for all Infinix customers and those purchasing ‘Infinix Note 4 and Note 4 pro’. The Infinix Note 4 and Note 4 pro was recently launched as the brand’s big smartphone of the year; the sophisticated smartphone features a stylus ‘Xpen’, Xcharge, 4500MAH battery, XOS 2.2 and it guarantees users 5 minutes charge for 250 minutes talk time. Infinix customers and fans can win big during this campaign. The big wins include 7 ’43inch Television’ for 7 customers in 7 cities. Infinix is also offering 14 Synix standing fans to customers from the raffle draws, which will take place once every week in Lagos, Port Harcourt, Abuja and Ibadan on the 21st and 28th September 2017. All Infinix Note 4 and Note 4 pro customers who purchase from Wednesday, September 13th, till Thursday, September 28th, qualify for the final raffle draw to win the 7 television sets. customers/fans must use the hashtag #Infinixng57. Watch the raffle draw live on Facebook on Thursday, September 21st & Thursday, September 28th, 2017. All participants must be following Infinix on Facebook, Twitter, and Instagram.